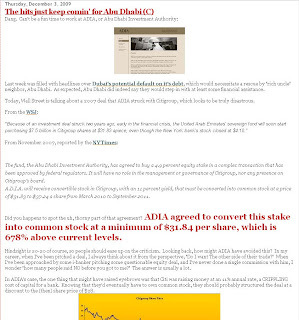 I wrote a few weeks ago in "The hits just keep comin' for Abu Dhabi "
...that thanks to a 2007 equity infusion, ADIA was on the hook to convert that position into Citi common stock at a minimum price of $31, or 771% higher than the current price. Well this afternoon, ADIA attempted to back out of this disastrous deal. Dec. 15 (Bloomberg) -- Citigroup reported that an arbitration claim was filed against it today in New York by the Abu Dhabi Investment Authority, which purchased equity units from the company in November 2007. The units obligate the authority to purchase a total of $7.5 billion of common equity on specified dates in 2010 and 2011. The arbitration claim alleges fraudulent misrepresentations in connection with the sale and seeks rescission of the investment agreement or damages in excess of $4 billion. It's pretty simple, Abu Dhabi. You were rich and idiotic, and you listened to I-bankers.